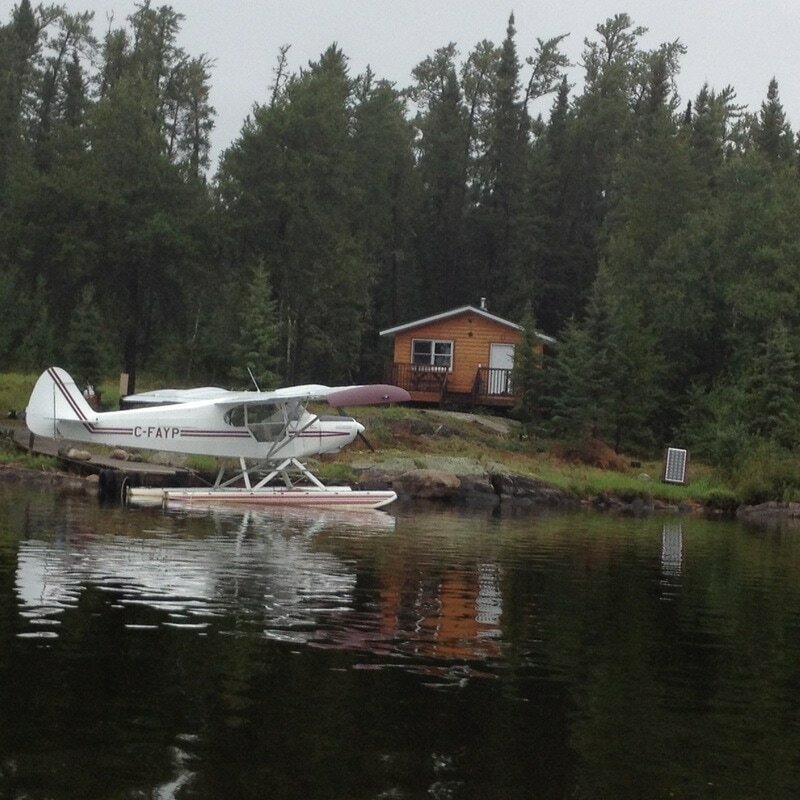 Winoga Lodge operates 8 outposts - 5 fly-in and 3 boat-in. Each outpost and lake offers a unique wilderness adventure. Choose one of our outpost for the fishing experience of a lifetime. 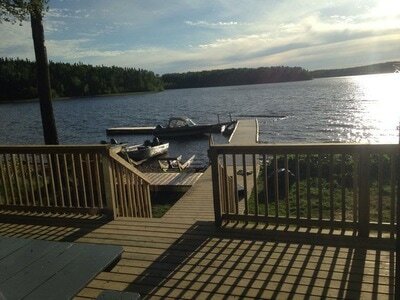 Vaughan Lake is actually a part of Lac Seul. It is 15 miles long and 4 miles across at its widest point. 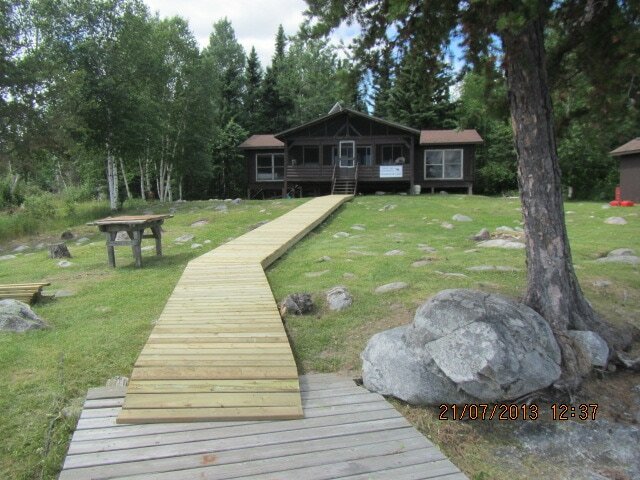 Boat access to the rest of Lac Seul is only 4-miles from the cabin. 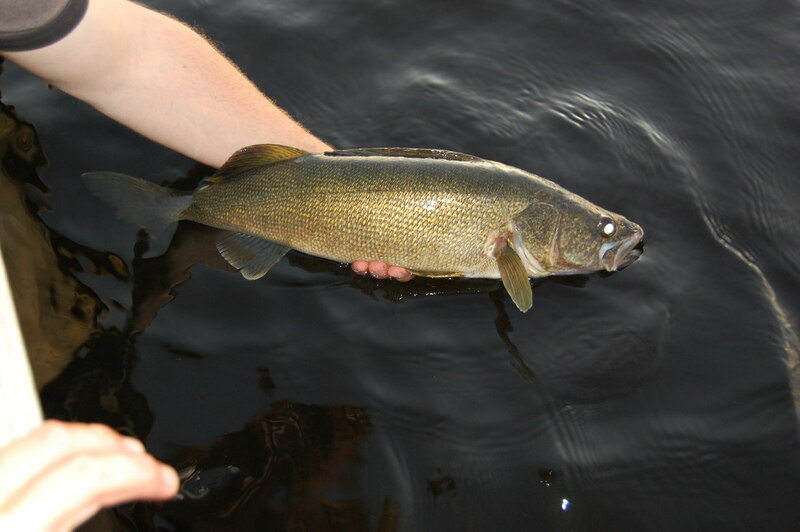 Vaughan is an incredible walleye fishery, and being a fish sanctuary, is closed to fishing until mid June. Northern pike, smallmouth bass and perch are often overlooked because of the amazing walleye fishing where up to 100 walleyes can be caught per person in one day. Walleye average 15-inches to 22-inches, but some have been caught in the 30-inch + range. 20 lb northern pike are caught every year in Vaughan. The Vaughan cabin is 20-feet X 24-feet with 2 bedrooms that sleep 6 guests. 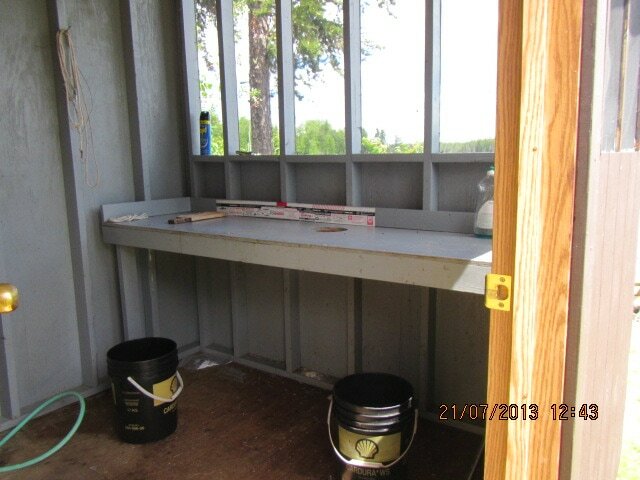 There is a separate shower house just off the front deck. 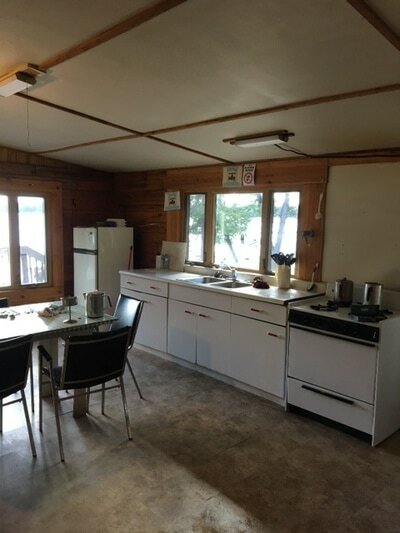 There is a generator at the cabin for electricity. The boats are 18-foot Crestliners with 40-50 hp 4 stroke Yamaha motors. The boats are equipped fish finders (that include GPS with lake map chips), pedestal seats, bilge pumps, paddles, nets, minnow buckets, life jackets, anchors and survival kits. 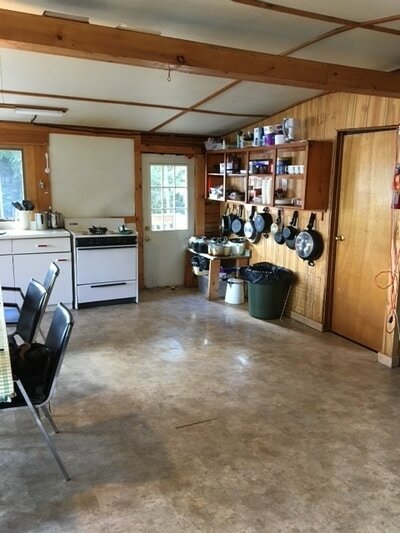 You can drive to within 8 miles of the camp via paved roads. Lake St. Joseph is a large 154,000 acre lake that is 80-miles long and in places 20-miles wide. 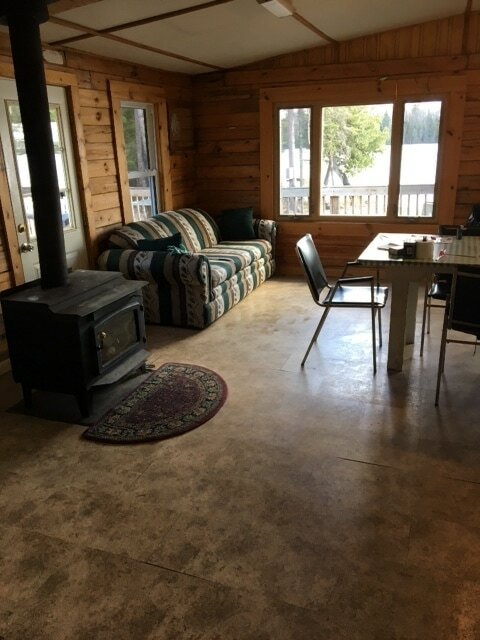 The cabin is located on what many refer to as "the best spot on the lake" for large walleye, northern pike and whitefish. Some of the best fishing is right off the end of the dock! 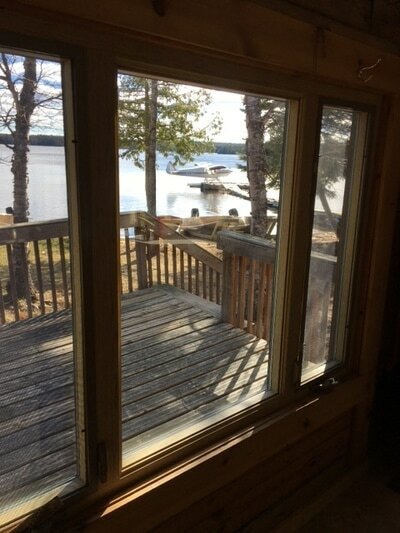 The cabin is centrally located on the lake in a bay that's protected from the wind. 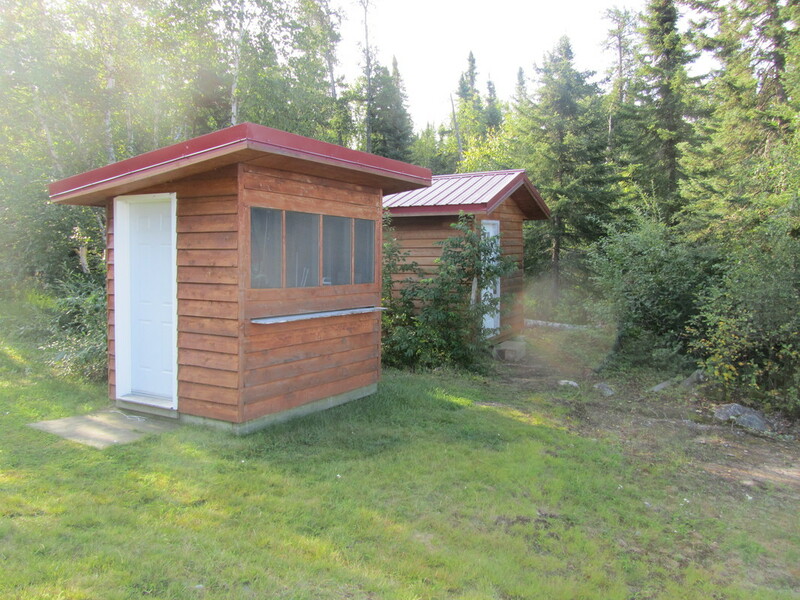 It is a 134-mile drive from Winoga's main base in Sioux Lookout to the parking area on Lake St. Joseph. 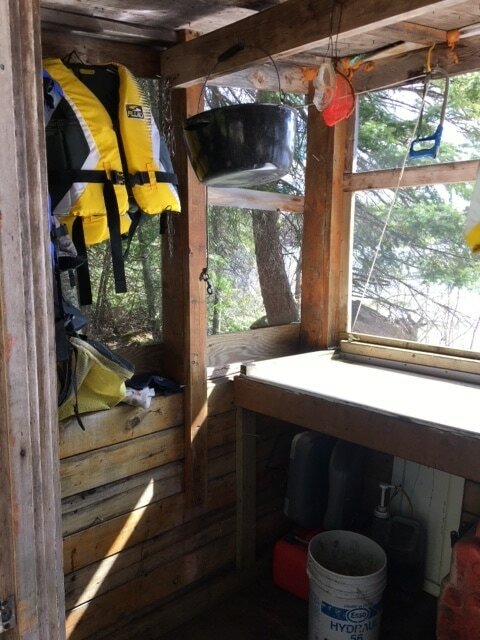 Then, a senic 40-minute boat ride on Winoga's 27-foot barge carries everyone in the group and all the gear to the cabin, virtually in the middle of nowhere. The cabin itself has redefined the remote outpost camp. The accommodations are the best in the area. The cabin is a large two storey log structure set back from the lake in a large bay know as "Ice House Bay". The cabin can accommodate up to 10 people, with two bedrooms on the main floor and a large loft upstairs. 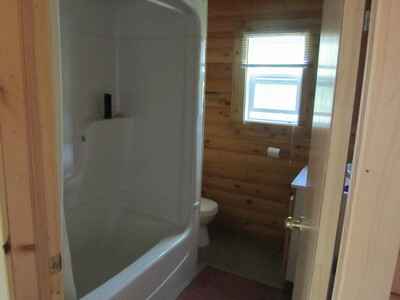 The cabin features a full bathroom, including hot and cold running water, a flush toilet and surround tub with shower. A large solar system provides electricity to the cabin, with generator back up for cloudy periods. Satellite WiFi internet is also a feature of the Lake St. Joseph cabin. 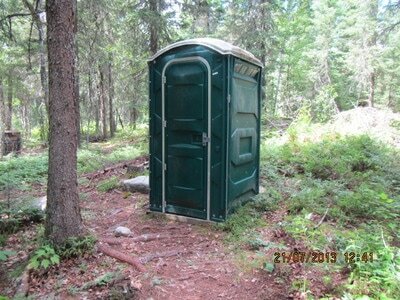 It is a great place to witness the northern lights or hear the cry of wolves in the distance. 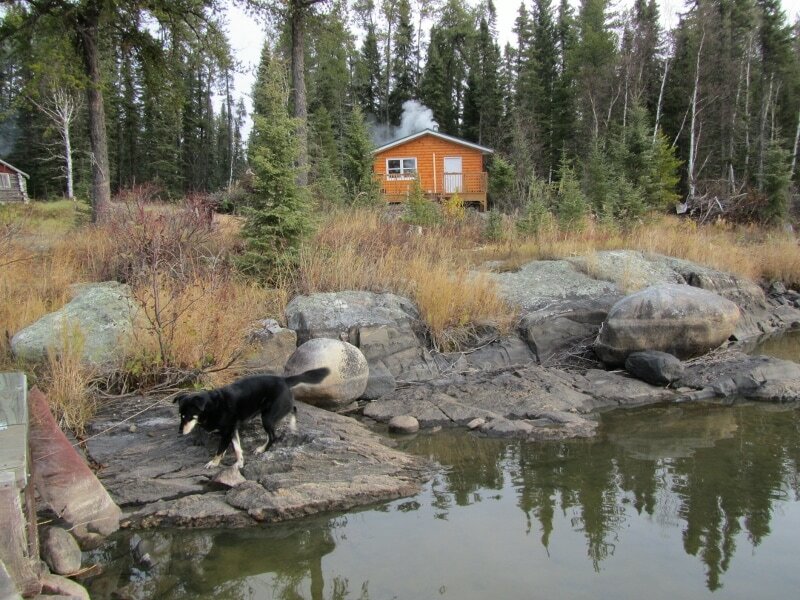 Moose and woodland caribou are common sightings on Lake St. Joseph. The Boats are 16' Alumarines with 20 hp Mercury four stroke motors with "Rockhopper" motor guards. An accord has been established between the Ministry of Natural Resources and the four tourist operators on Lake St. Joseph. This means fishing licences are restricted to a tag system where only 1956 non residents are allowed fishing tags in a season. 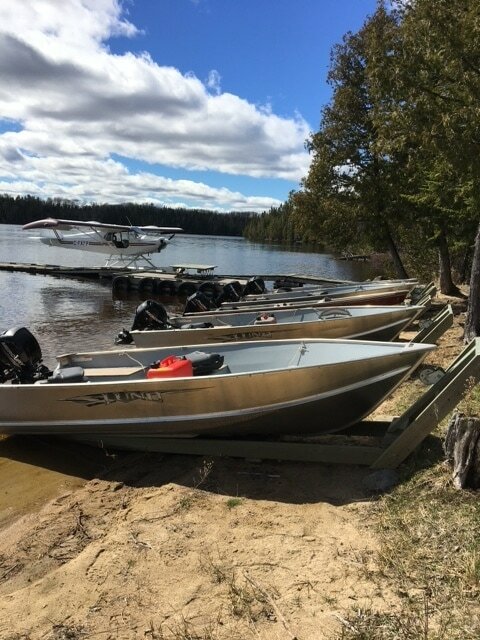 Along with barbless hooks and size limit restrictions of walleye and northern pike, Lake St. Joseph is guaranteed to remain one of the greatest fisheries in the world. It is not uncommon to catch 10 lb walleye and northern pike in the 20 lb range. This outpost camp is located on a private island in Northeast Bay of renowned Minnitaki Lake. It is a scenic six-mile boat ride from Winoga Lodge's main base to the cabin, which is located just just 1.3 miles east of "The Chutes". It is secluded with two cabins at opposite ends of the island. The island can be rented as your own private island with both cabins or cabins can be rented out separately. 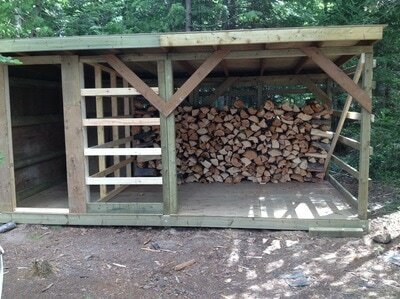 The north cabin can sleep 8 people and the south cabin 6-7. 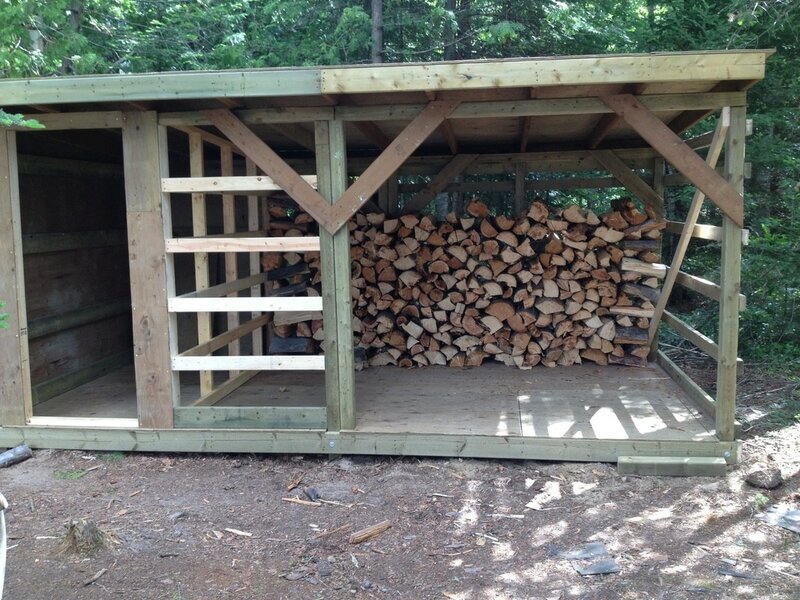 Each cabin has its own brand new floating dock system and both have wood fired sauna's. 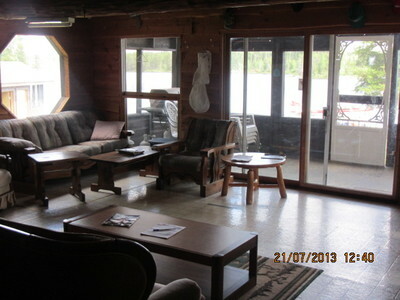 You can bring your own boats or boat rentals can be arranged. The island is great for fishermen or just pure relaxation. There are a couple canoes available for rent at the island for your enjoyment. The island is so close to Sioux Lookout but it feels like you're in total seclusion. You are within range for cellular use of phones, which is a bonus. 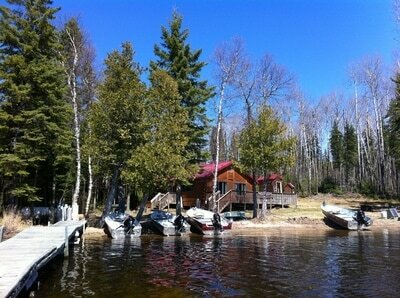 The lake is known for walleyes, northern pike, lake trout, smallmouth bass, whitefish and jumbo perch. 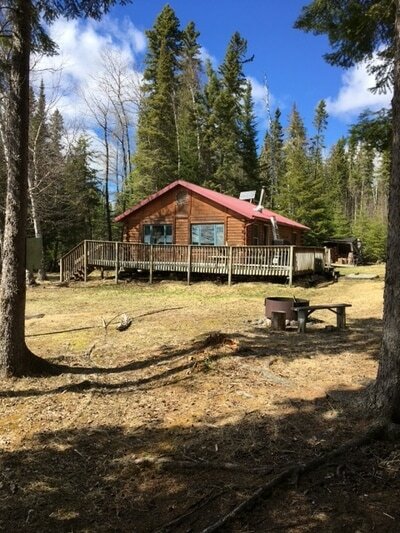 New for 2019 - Raggedwood Outpost has satellite WiFi internet. 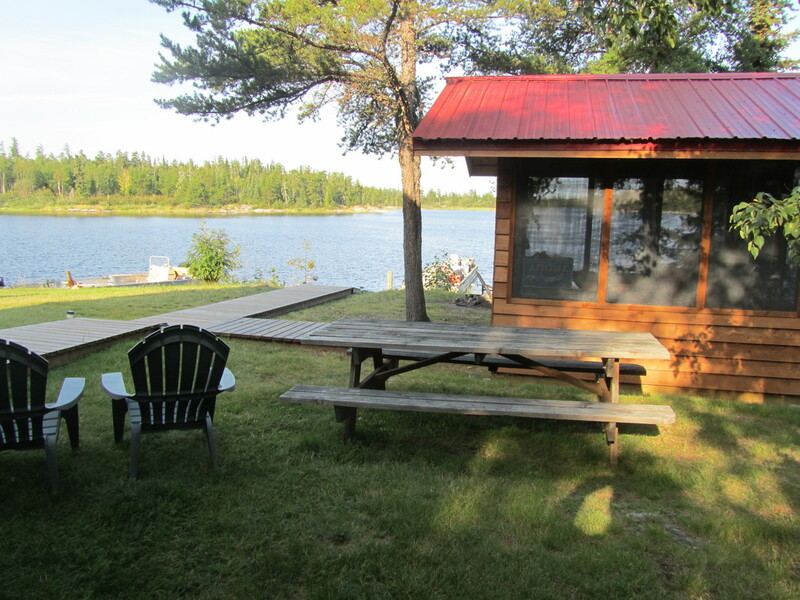 Raggedwood Lake is our original outpost cabin located 42-miles NE of Sioux Lookout. This fly in Outpost offers your group a real wilderness experience. 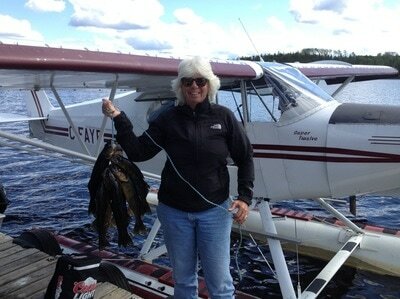 Great fishing and good times is what keeps our customers returning year after year. The spacious log cabin is located on an island in the middle of the lake. 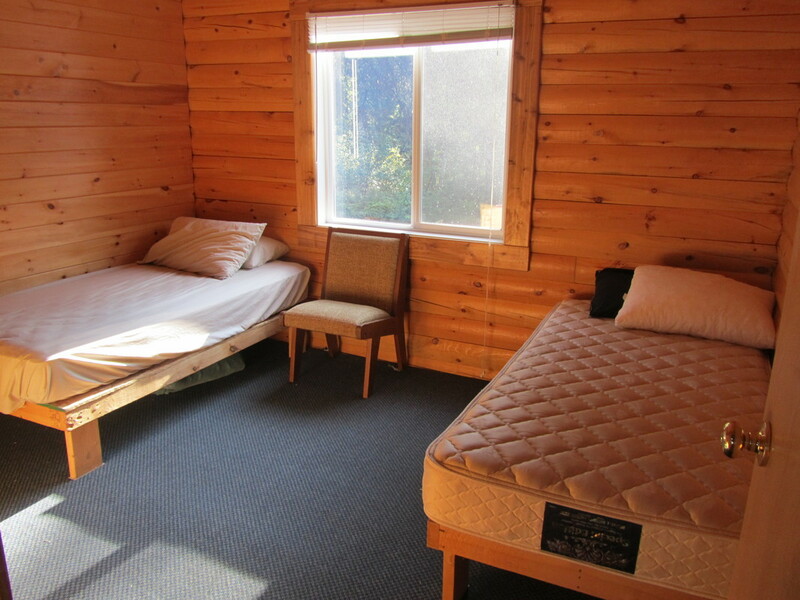 There is a separate sleeping cabin next to the main cabin to sleep a total of six. 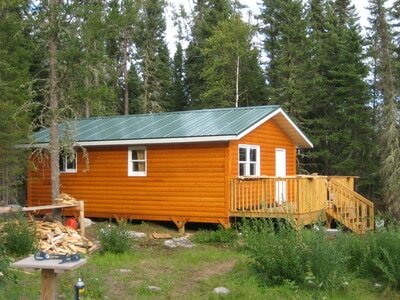 The Raggedwood cabin features running water, shower facilities and a generator for electricity. All cooking and eating utilities are supplied. 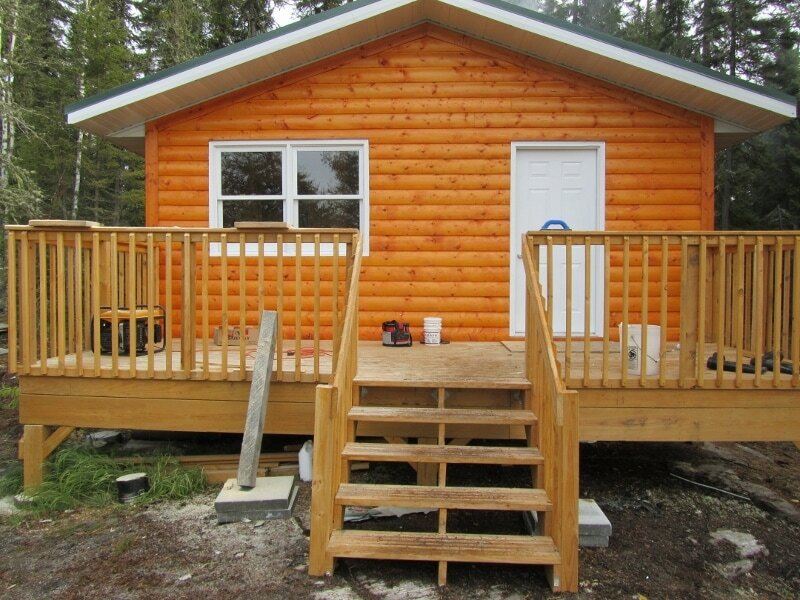 All you need to bring is food, sleeping bags, towels, fishing gear and personal belongings. The boats are 14-foot Lund's with 15 hp four stroke Mercury motors with "Rockhopper" motor guards. Raggedwood Lake offers the best in wilderness fishing for walleyes and northern pike. We also have moose tags for the fall hunt. 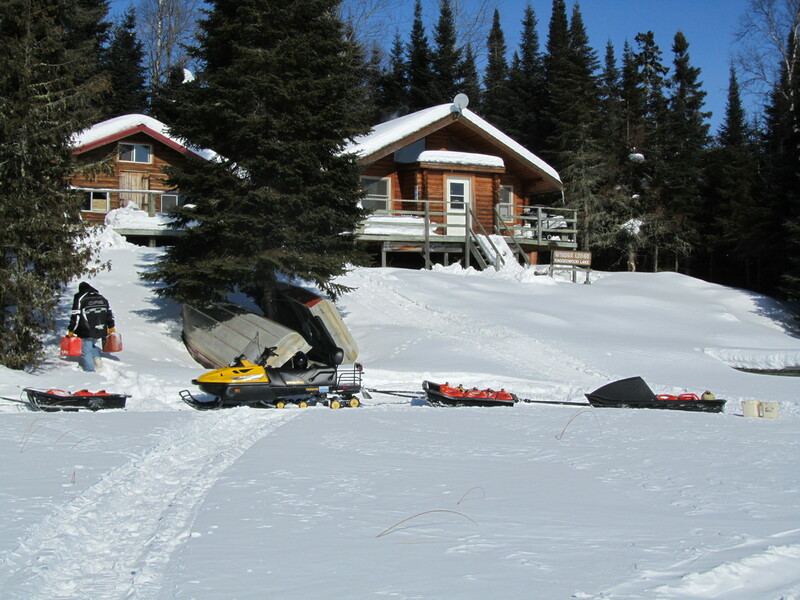 Raggedwood can be accessed in the wintertime to enjoy snowmobiling and ice fishing. The snow is sparkling white and you can go for miles. 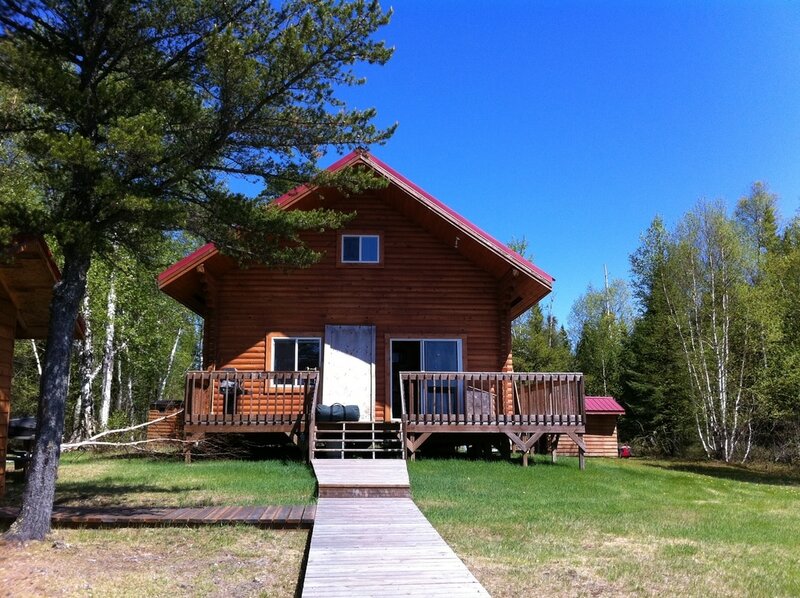 Raggedwood offers the ultimate in seclusion and is very picturesque. 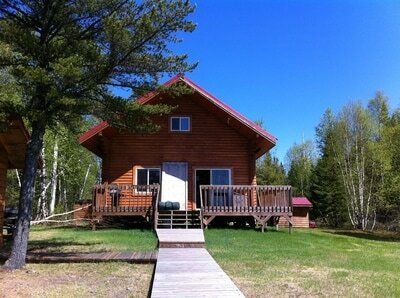 It is a great getaway for families or other fishing and hunting parties. 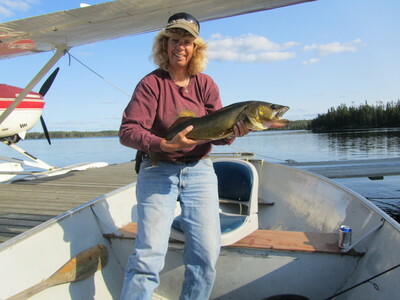 Root lake is just 57-miles north of Sioux Lookout and is a strong walleye and northern pike fishery. There has been very little fishing impact on this lake for many years. 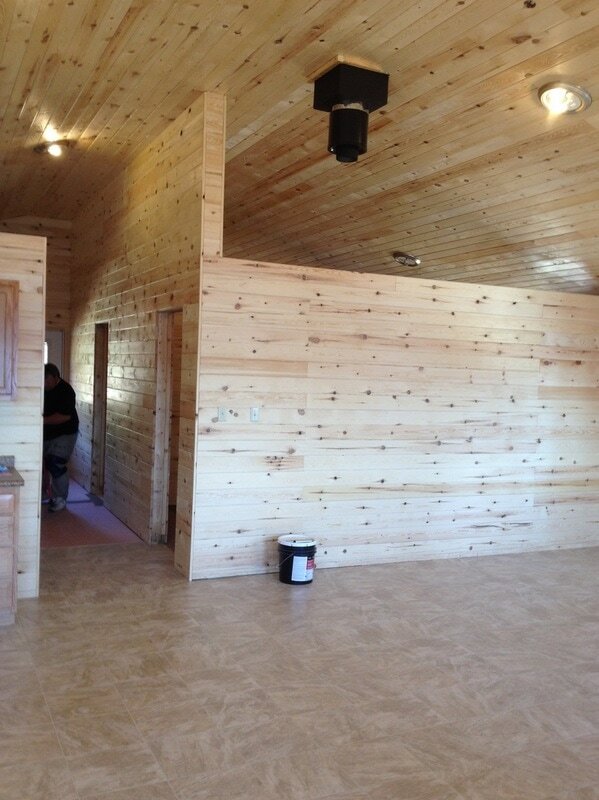 The cabin was built in 2011 and has two bedrooms that can sleep 6. 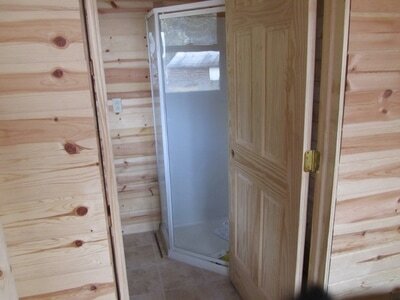 There is a shower room inside the cabin and a generator is supplied for electricity. 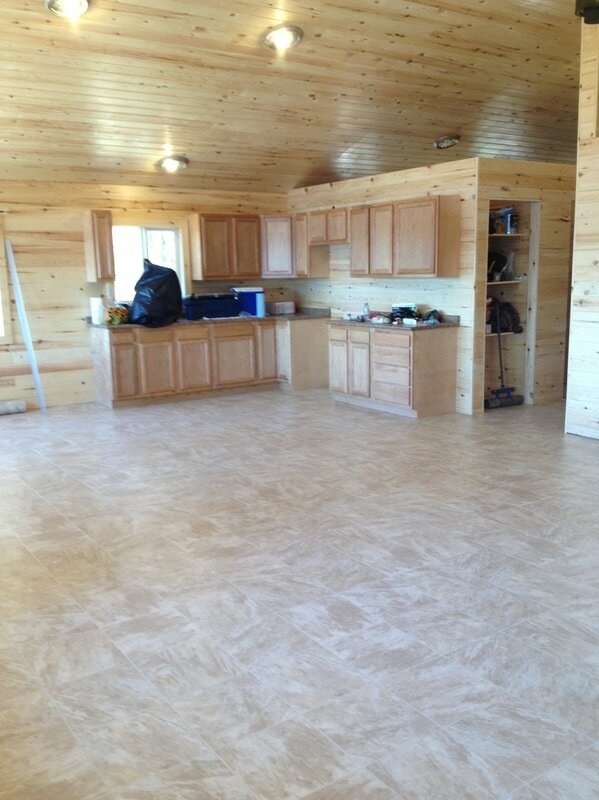 The cabin is very well insulated and can be used during the winter months for ice fishing get aways. The boats are 14-foot Lund's with 15 hp 4 stroke Mercury motors. 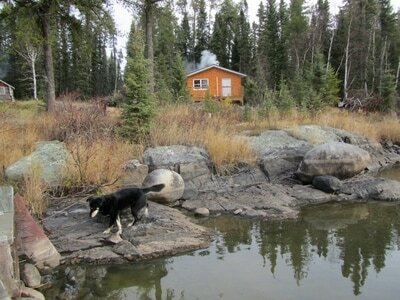 The lake is a wildlife enthusiasts dream! 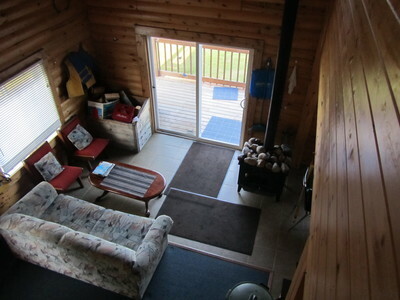 There is a large active eagles nest just down the lake from the cabin. 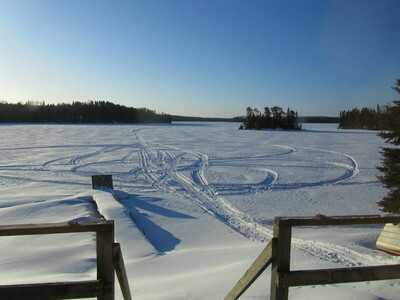 We have watched lynx walk across the frozen lake out in front of the cabin. Wolves can be heard at night and otters, mink and marten live and play during all seasons. Moose are often spotted in the river that flows out of the lake and it is a natural habitat for caribou also. 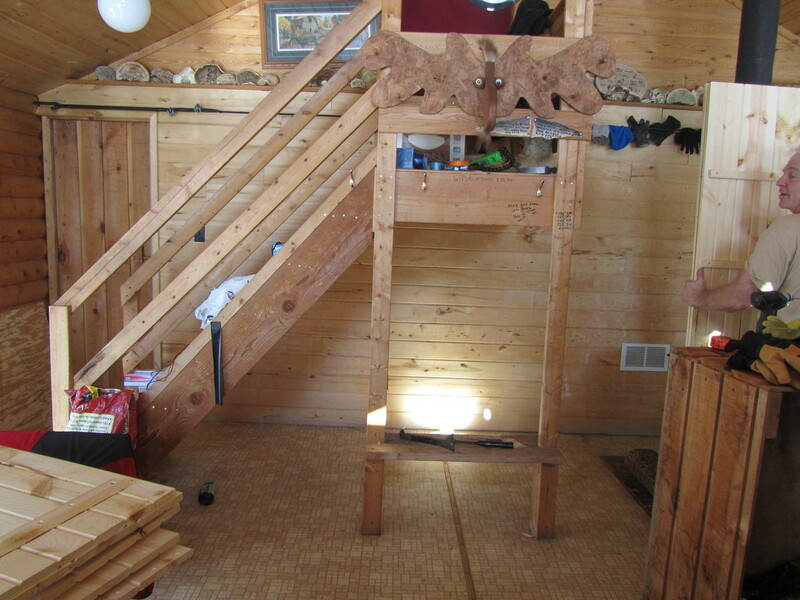 The old "Root Lake Hilton" cabin is still standing and is now being used for storage. It is worth a peek inside to take a trip down nostalgia lane with the many stories that take up every inch of the inside of the cabin! 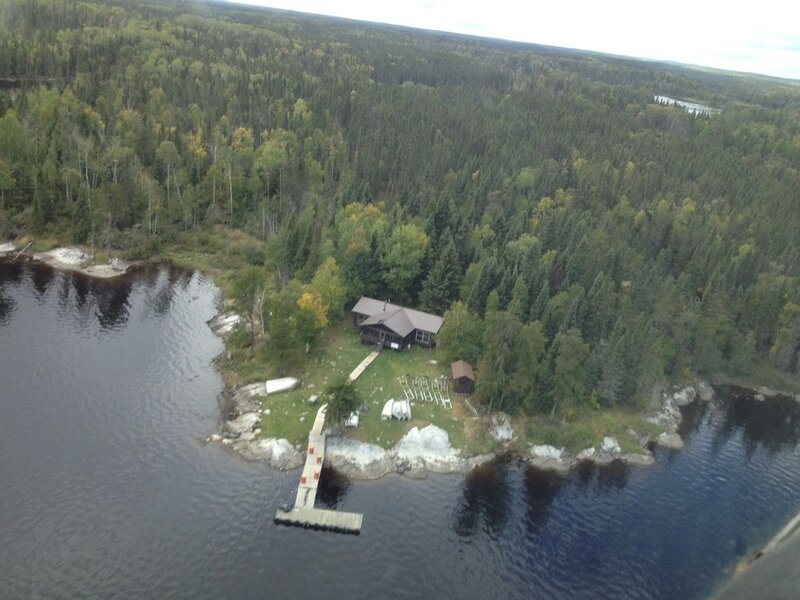 Highstone Lake is 29-miles NE of Sioux Lookout and is a short 15 minute flight. Highstone Lake connects to Bury Lake to the east and Highball Lake to the west. There are many arms and bays to explore on this 18-mile long lake. 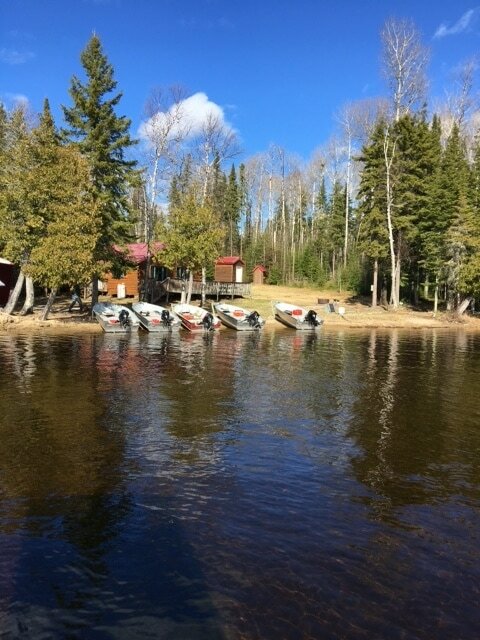 It has a good walleye fishery plus trophy northen pike are caught every year. 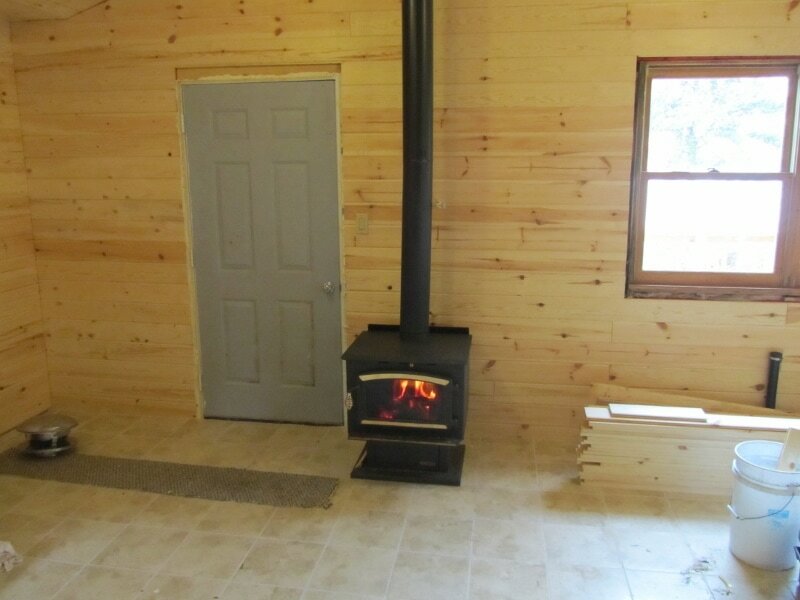 The fully insulated cabin was built in the spring of 2016. 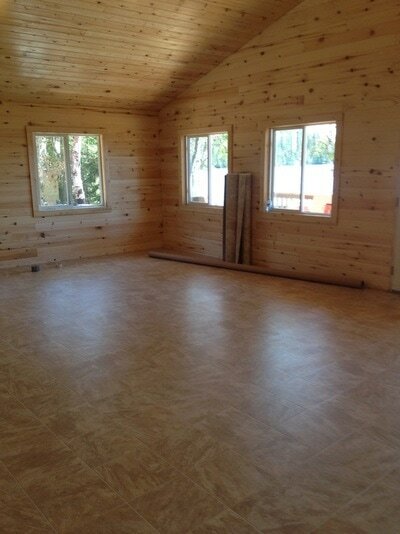 It has three bedrooms that will accommodate up to seven guests. 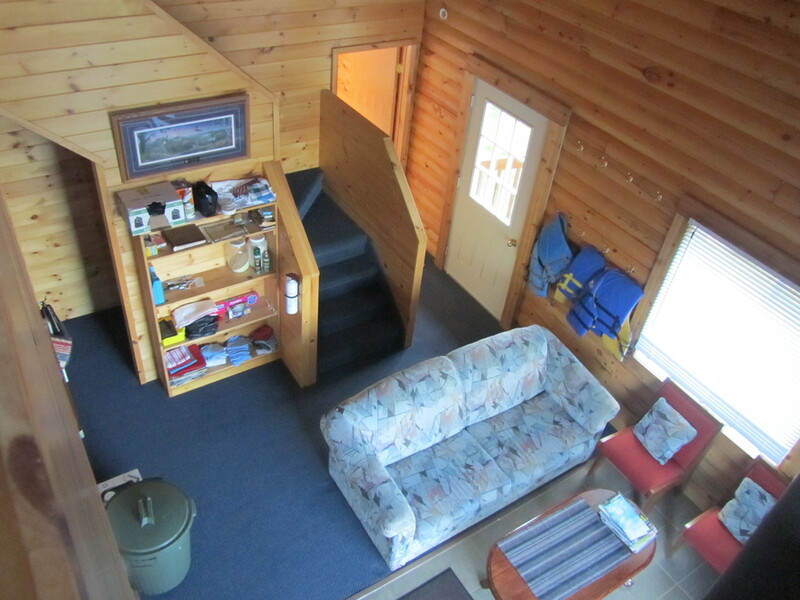 The living area is spacious with Laz-Y-Boy furniture to relax on. There is an inside shower room with vanity and fully equipped kitchen with a large solar powered fridge and deep freeze. 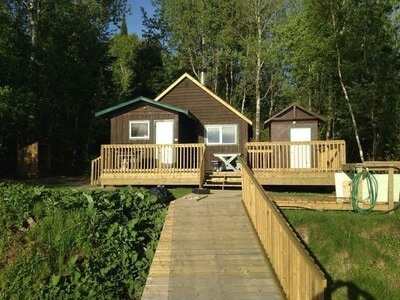 There is a large dock built along the beautiful beach that's out front of the new cabin. The boats are 14-foot Lund's with 15 hp Mercury four stroke motors with "Rockhopper" motor guards to protect the power units. Carling Lake is located 45-miles by air from Sioux Lookout. Carling Lake is a favourite for fishermen as it has healthy populations of lake trout, walleye and northern pike. The lake itself is long with many long narrow arms to explore. The cabin is located on a beautiful sand beach that is great for swimming. 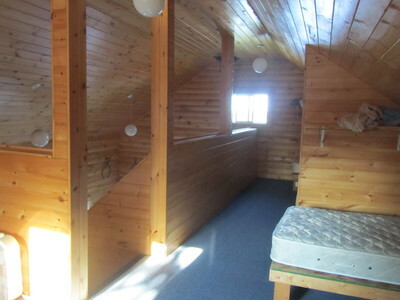 It has two bedrooms that can accommodate eight people. There is a separate shower house beside the main cabin and a fish cleaning shed down by the beach. There are five 14-foot Lund boats with 15 hp four stroke Mercury motors with "Rockhopper" motor guards. 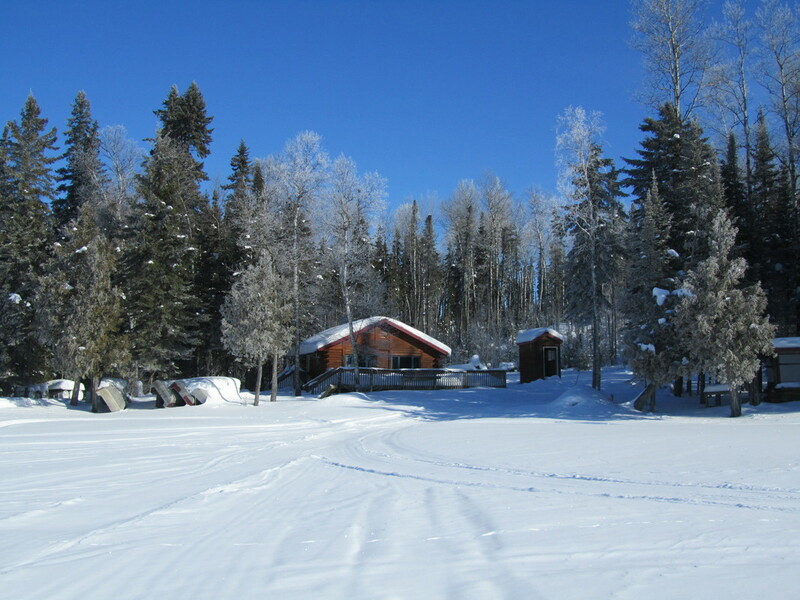 The lake connects several remote lakes through rugged hiking trails for the more adventurous souls. 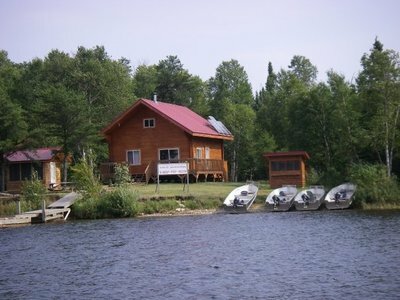 Roadhouse Lake is located 71-miles north of Sioux Lookout on the infamous Cat River chain of lakes. It is only separated from Lake St. Joseph by Blackstone Lake. The lake is known mainly as a "walleye factory", with many 100 fish per person days. You don't have far to go to wet a line to catch your lunch in just minutes. Trophy northern pike lurk in the many bays of Roadhouse Lake and moose and woodland caribou are spotted regularly. The lake itself is a tea stained colour with two large inflows. 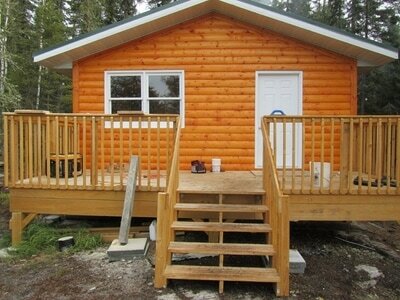 One of which is located right at the cabin, and the other at Gage Lake, just below Roadhouse Lake. 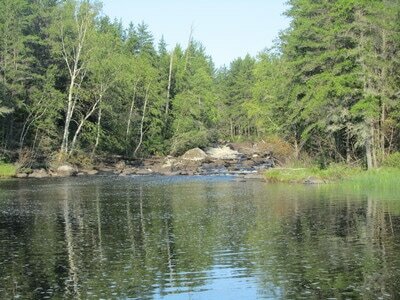 There are several rapids in succession that drain the lake to the south into Blackstone Lake. The cabin is a spacious log building with a large screen enclosed porch off the front. It has four separate bedrooms that can accommodate 10 people. There are two propane fridges, a propane deep freeze, large bar-b-que, solar powered lights, running water, on demand hot water and an indoor shower room. 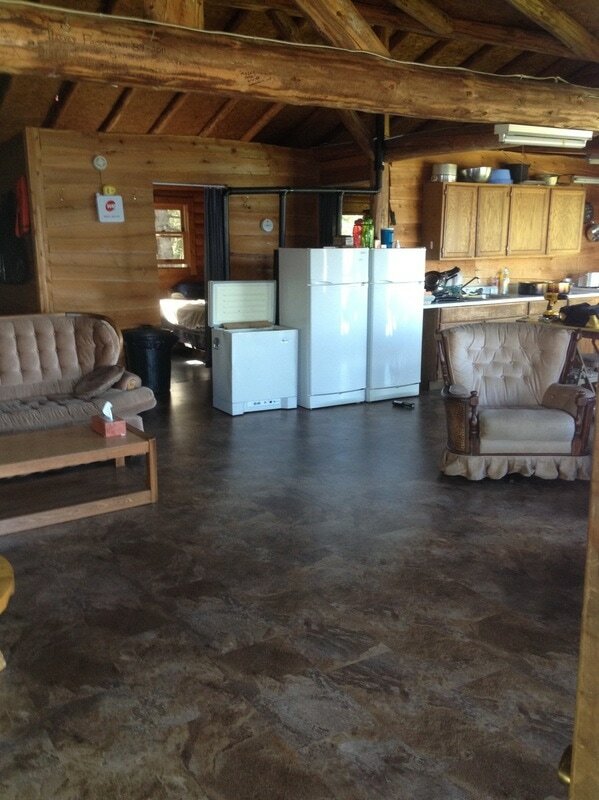 There is a large living area and fully equipped kitchen. 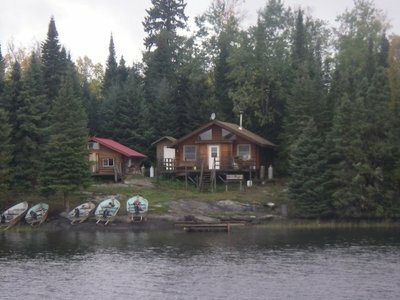 A gas and storage shed and attached fish cleaning house are located down by the lake. There are five 14-foot Lund boats with swivel seats and 15hp Mercury four stroke motors with "Rockhopper" motor guards. ​Ask about "Kimmer's Big Fish Contest" and check out how to win a free fly in fishing trip to Roadhouse Lake. 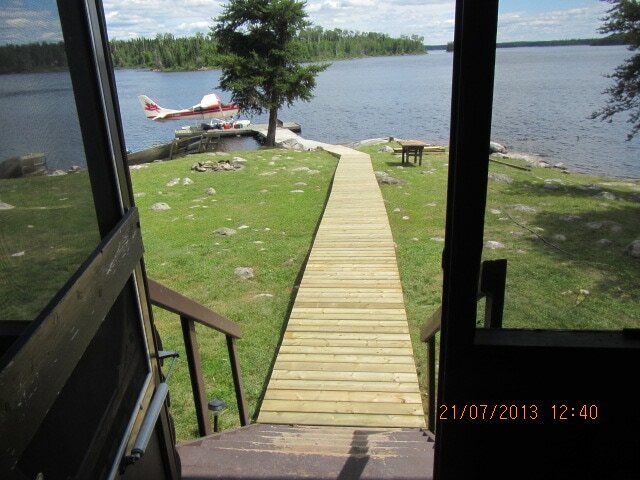 Winoga Outposts uses Slate Falls Airways located in Sioux Lookout for the majority of our flying needs. Their fleet of aircraft consist of 2 turbine engine Otters, a Beaver, and a couple Cessna 206's. All aircraft are flown by safe, well trained and competent pilots. All gear and passengers are weighed at the scales at the water base prior to your flight. 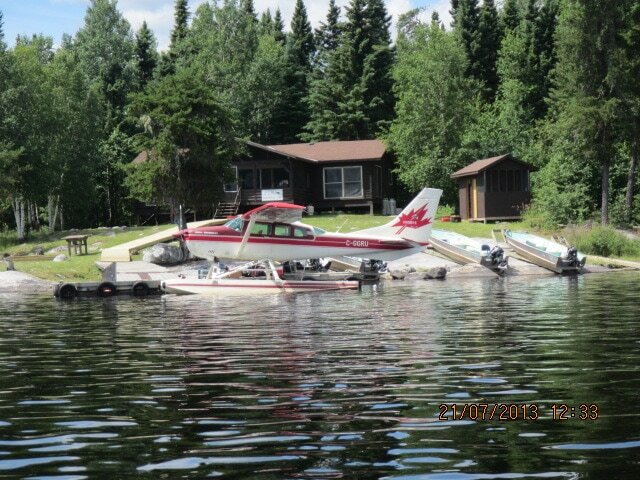 Depending what lake you're flying into there are weight restrictions with each aircraft. 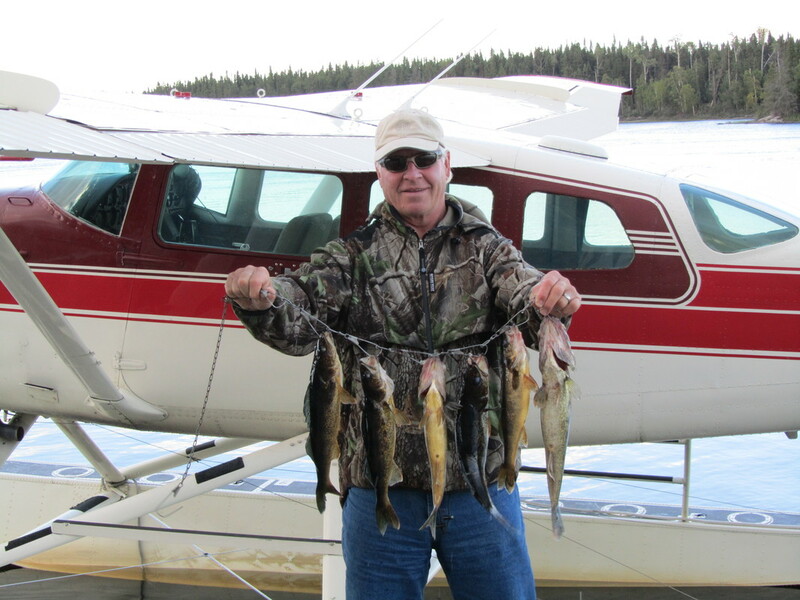 A party of six fishermen are expected to fit into a Turbo Otter no problem and seven fishermen if the flight is into Highstone Lake because of the short mileage. Winoga Outposts has a small Piper Cub that is used for check flights into the various outpost camps. 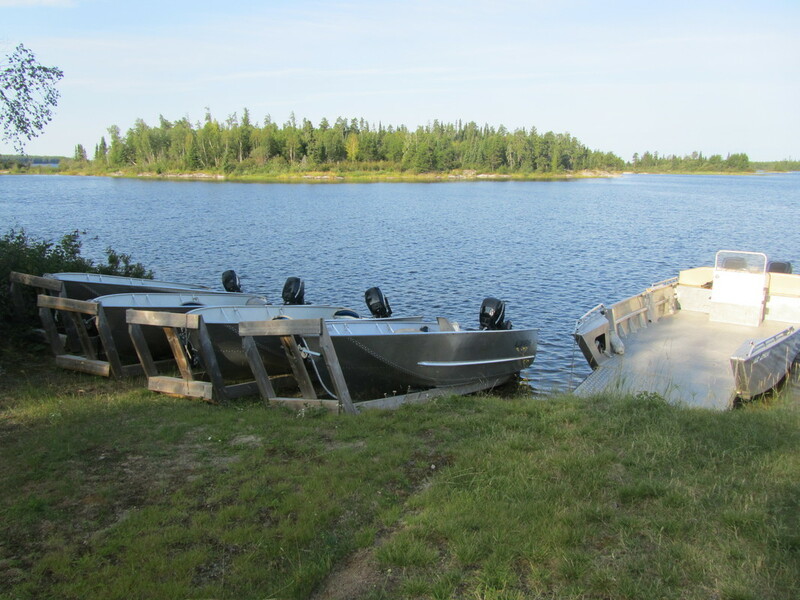 Winoga Outposts operates a 26-foot Stanley landing craft with twin 225 HP Mercury motors. Guests heading into Lake St. Joseph meet the "barge" early on Saturday mornings at the HWY 599 landing. The "barge" hauls all gear and guests to the cabin. 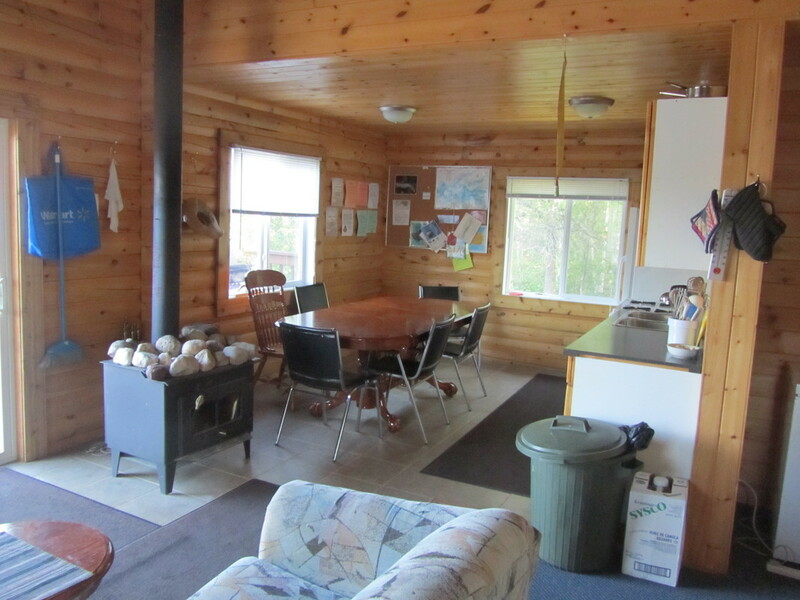 The 25 mile boat ride to the cabin is approximately 40 minutes. Vaughan Lake is accessed by 40 and 50 HP Yamaha camp boats. Vehicle parking and boat access is at a private landing near the causeway to Kejick Bay on Lac Seul. All road travel to the landing is on paved roads. The boat ride from the landing to the cabin is approximately 8 miles or about 20 minutes. The Minnitaki Lake Private Island cabins can be accessed by boat from the Winoga mainland camp. If boats are not required for your stay, a transportation fee will be charged to shuttle your party back and forth from the island. 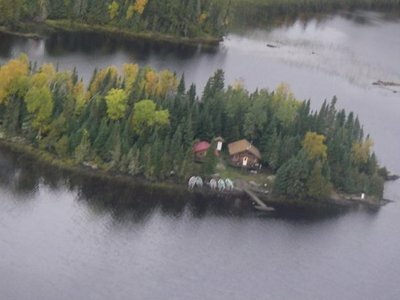 It is about 6-miles from Winoga's mainland camp to the private island.